Easy Installation: no drill, no modification required, lamps can be installed directly. Practicality: 60° horizontal & 180° vertical adjustment, assemblies correspond to front, rear, left, and right of the vehicle. Anti-slip: designed with anti-slip teeth and rubber mats, the lamp can be firmly fixed without scratching the car. Durable: 304 stainless steel material, 3-year warranty. 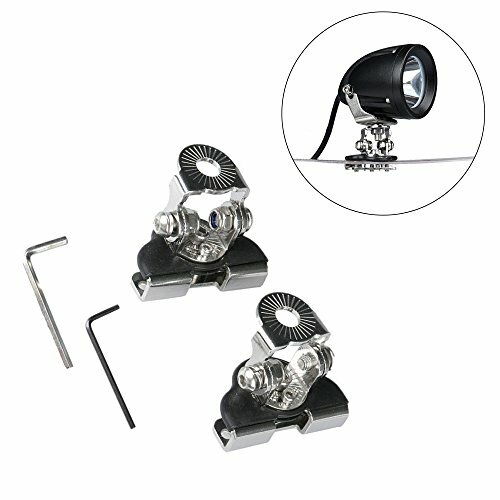 Features: new universal work light bracket, help you retaining the light bar on a spacer plate (gap < 9mm), like engine hood, roof racks.. Please check size to make sure the fitment before bidding. Thank you. Features: new universal work light bracket, help you retaining the light bar on a spacer plate (gap < 9mm), like engine hood, roof racks. If you have any questions about this product by Triclicks, contact us by completing and submitting the form below. If you are looking for a specif part number, please include it with your message.